First read "Motion Offense". So you want flexibility and want to vary your offensive attack, while maintaining the 3-out,2-in as your basic set. Here are some simple options to run off the 3-2 set. These do not necessarily have to be called as set plays, but can be taught to the players as various options to use within the general motion offensive scheme. To change to a 1-3-1 set, call "1 up" and the weak-side low post player moves to the high post. If the ball is on the point, O5 moves to the high post. This is also a good set to use against the 2-3 zone defense. Want to show a 1-4 stack set, call "2 up" and both posts move to the elbows. Now you can run the 1-4 stack offense and plays. Call "4 down" to run a simple low stack play such as this. O1 drives and tries to create his own shot, or dishes off to a teammate. O2 and O3 set picks for O4 and O5. O2 flares out for a three-point option. O3 moves out on top as prevent man on defense. Want to overload a zone (in this case the right side)? Call "3-cross" to have O3 makes a cut to the hoop, and then out to the opposite corner. Now the right side of the floor is over-loaded. If O1 passes to O2, you'll have a ballside "triangle" with O3, O4 and O2. The defense is showing a 1-3-1 zone and you want to go to a two-guard front. Call "3 corner" to have your O3 slide down to his own corner, and O1 and O2 move over into a two-guard set. You can change to a 4-out, 1-in set by calling something like "4 Out to John", where John becomes the inside post player. See "4-out, 1-in motion offense". If you have good quick guards in the game, run the open post (5-Out) offense. Call this "5", rather than "5-Out". Once I called "5-out" and the ref charged me with a time-out, thinking I had yelled "time-out" instead of "5-Out"... so just call this option "5". See "Open Post Offense". Wing to Low Post Motion. 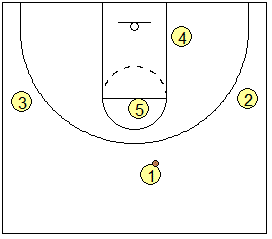 The wing O3 sets a down-screen for the low post, who curls around the screen for pass from O1. After setting the screen, O3 can seal for the inside position and the pass from O1, or flare out to the short corner or wing for a pass for an outside shot. The low post O5 sets a back-screen on the same side wing defender. The wing O3 cuts backdoor for the pass from O1. After screening, O5 can also seal and roll for a pass from O1. If the defense switches the screen, O5 seals and slips the screen, cutting to the hoop for the quick pass from O1. O4 sets a pick for O5 who cuts off the screen for the pass from O1. This is the same play as option 1. In this case the defenders switched the screen, and the X4 defender picks up O5. Reading this, O5 takes the defender out to the short corner. O4 has inside position after screening and sealing the defender, and gets the pass from O1 (who dribbles a little to the right to set up a better passing angle).